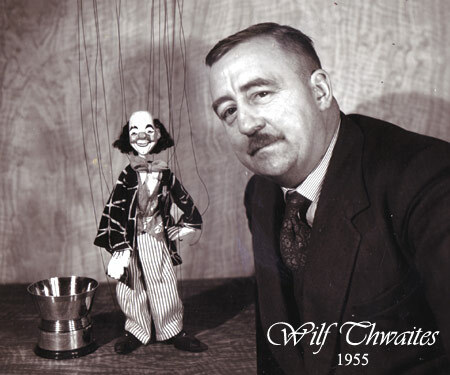 Leeds Puppeteer, Wilf Thwaites was a talented professional graphic artist who followed a familiar pattern of some of the early members of the British Puppet & Model Theatre Guild in developing his skills from the Model Theatre to the Marionette. 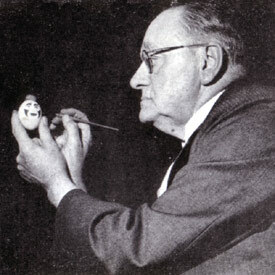 He became interested in Model Theatre in the early 1940s and embarked upon a grand project to re-create the complete works of Gilbert & Sullivan in miniature, including a 60-piece orchestra which 'tuned up' before each performance. For the non-Gilbert & Sullivan aficionados, he also staged Variety Theatre in miniature, populated with caricatures of the Variety Greats of the day, who he researched by going to the Leeds City Varieties Theatre every Saturday to both the Matinee and Evening performances. 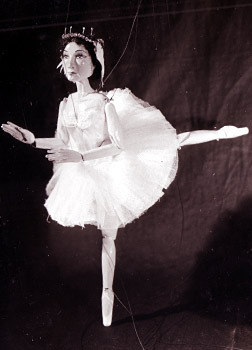 Between shows, he would dine at a nearby fish and chip shop and sketch pictures of the stars of the show - stars such as Sandy Powell and George Formby - he would then return to the Stage Door to present his sketches to the performers themselves before seeing them again in the evening show and upon his return home, re-creating those same variety stars as toy theatre figures. 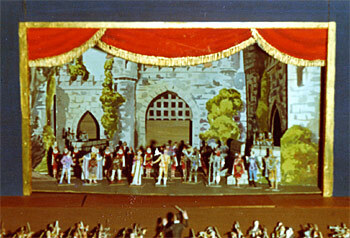 Wilf Thwaites' Model Theatre "Yeomen of the Guard"
In 1952, he changed direction and began working with marionettes - his performances being staged mainly as fund-raising events for local charities. 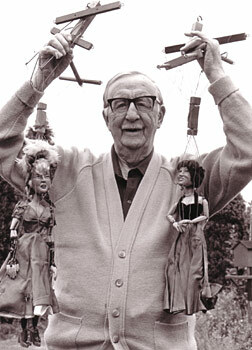 He performed regularly in his local Village Hall and as Scoutmaster, encouraged his Scouts and Cubs to take an interest in making and performing marionettes. 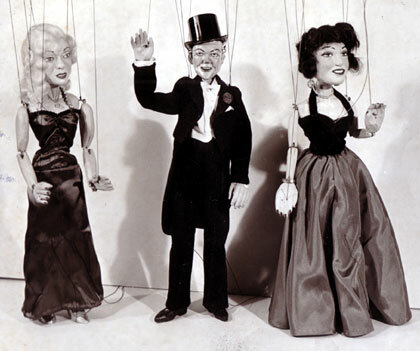 His proudest moment in puppetry came in 1955, when he won the "Bulto Bowl" Award for the best circus-themed puppet at the Annual Guild Exhibition. Below is a report of that event from the 5th November 1955 edition of "The World's Fair." 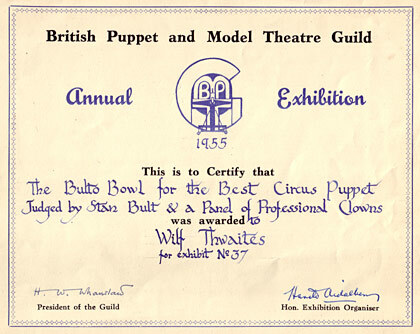 On Saturday morning, I paid a third visit to the British Puppet & Model Theatre Guild Exhibition, the purpose this time being to function as one of the panel of eight judging the entries for the 'Bulto Bowl' (Award for the Best Circus Puppet) - the others being Mr Stanley Bult himself, Butch Reynolds, Smokey Townsend, Chester Field, Toni Gerbola, Tommy Keel and Harold Whiteley. In due course, we all finished our examination and assessment, agreeing that the standard of entries for the Bulto Bowl showed a marked advancement. Yet we were puzzled as to the continued fall from grace of so many puppeteers who, in fashioning their clowns, show the quaintest of notions in regard to make-up and costuming. One of the marking provisions on Mr Bult's cards every year being - "Is it correct in character?" 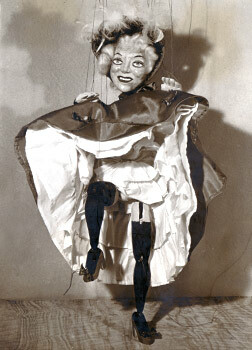 - and that is where, time and time again, these puppeteers lose points. 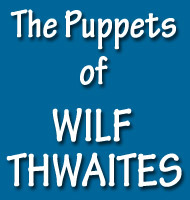 First of the thirteen entries was "Blotto" - figure of a droll - the work of Mr Wilf Thwaites. Out of a maximum possible 200 marks, Blotto secured 185. 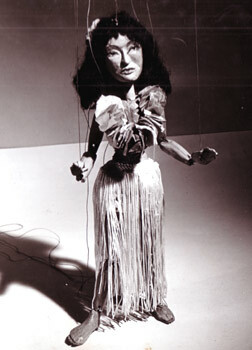 A very close second was "Bannister" - another droll - product of the Pompet Puppets and Third, not very far behind, came a pair of beautiful clown glove puppets made by the Worth Puppets.